The cottage "L'ARVOR" is part of a set of 3 cottages. Pleasant cottage with a large living room kitchen living / dining room, small back kitchen, fittings and quality equipment, separate toilet, bathroom with shower. In the other 2 beds of 90 and large wardrobe room also closed by curtains. The gite was excellent and well-equipped. Mme Dreau was very helpful and gave good advice on the lovely local area. The pool was exceptional and very clean. Our two young daughters swam twice daily and also loved the extensive outdoor space with bikes, table tennis, badminton, table football and play area. A great place to stay. Could not of asked for a more beautiful place to be. 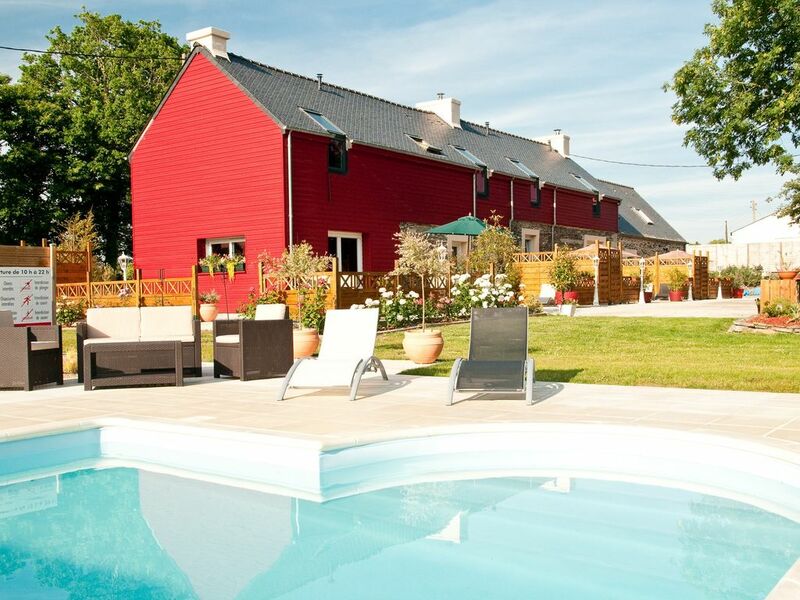 Set in private grounds swimming pool three lovely Gites really don’t want to say how beautiful it was or it will be booked up and we will not be able to stay again . On arrival first impressions, perfect, the owners hospitality was greatly appreciated after a long drive. Morgan was so enthusiastic and despite the language barrier, provided plenty guidance on the area and what to do. Was fun just talking with her. The Gite didn’t feel like a property but more like home, very well presented, clean and spacious with everything we needed. The facilities were great, heated pool, table tennis, table soccer all catered for in the vast outside private space. Le gîte est très bien équipé, bien entretenu et calme. Chouette piscine chauffée bien que le moteur(?) soit quelque peu bruyant. Sympathique accueil par la propriétaire qui nous a bien aiguillé pour nos découvertes de la Bretagne et qui a une une charmante attention en nous apportant quelques plaisirs gourmands. Le moteur de la filtration de la piscine a effectivement "rendu l'âme" un peu après d'où le bruit et depuis nous l'avons changé. Es war eine schöner Aufenthalt! Wir hatten eine angenehme Zeit in diesem Domizil. Die Vermieterin war super nett und immer bereit uns Informationen zu möglichen Ausflügen zu geben, oder kurzerhand Fahrräder zu organisieren. Der Pool war herrlich und man konnte sich vor oder nach einem Tagesausflug erholen. Das dazugehörende Gelände ist gepflegt und man sich dort mit den vorhandenen Freizeitgeräten beschäftigen.